Gaspari Myofusion Advanced – Click the image to get free release notifications and price drop emails! 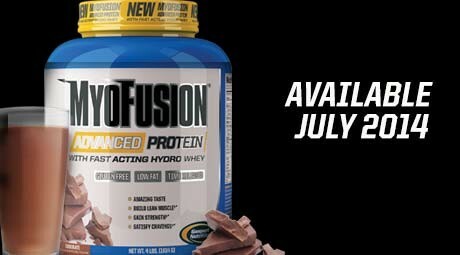 Today, we’re incredibly happy to announce Gaspari Myofusion Advanced Protein! 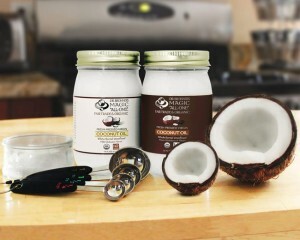 This is the next revision of the Myofusion protein product line, and is definitely our favorite one yet. It contains no added free-form amino acids, so you can be more confident knowing that the 25g of protein on the label is really 25g of protein! OMG look at this picture from our review! This stuff is RIDICULOUS!!!! Our Updated Bacon Maple Pancake Flavor! 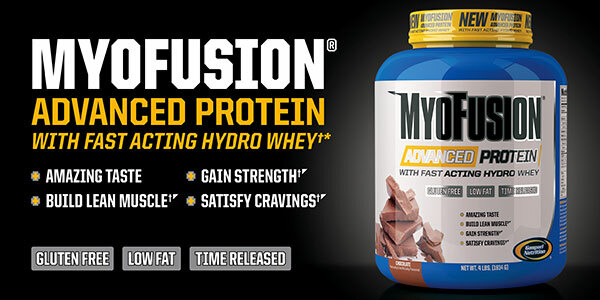 The Myofusion Advanced Ingredients – No added free form aminos, and MORE protein! 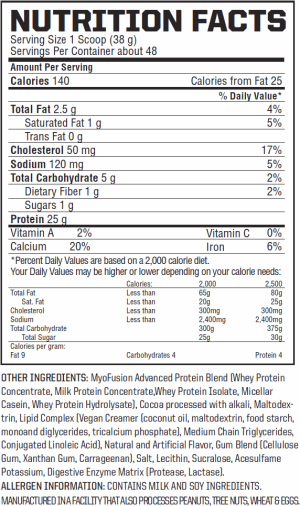 An extra gram of protein has been added, but due to the lack of added free-form amino acids, it’s possible that it’s even more effective than the other Myofusion formulas out there. This is discussed in greater detail below. As is usual, we don’t know the exact ratios. It’s worth noting that milk protein concentrate is normally about 80% casein, which is the thicker, slower-digesting protein. So this will probably be a very even blend of whey and casein, making it a thick and rich feeling blend. It goes without saying that if you’re very lactose intolerant, the concentrates here will not be your best friend, so tread lightly (1 max scoop per day) or avoid it completely and find a pure whey isolate instead. 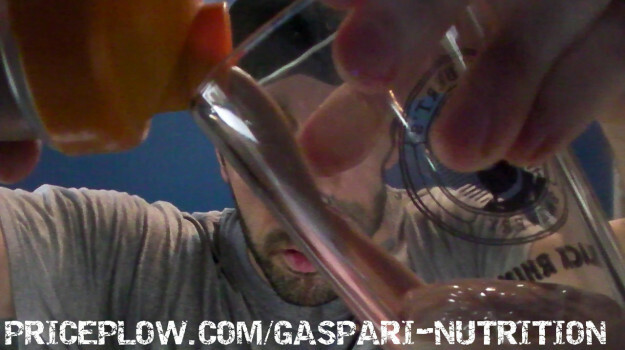 Gaspari makes an incredible one in IsoFusion. The interesting thing about this is the “vegan creamer” call-out. While this is clearly not a vegan product, since it’s using cow’s milk… one thing that some users get upset about is the use of animal-based gelatins or lecithins. You can see why on PETA’s website. This does not have that, which is why the creamer blend has the word “vegan” in there. Anyway, if you’re looking for an ultra-clean profile or are on a strict paleo diet or something, then obviously this isn’t the one for you – but Gaspari’s customer base doesn’t normally care about taking things that far. We’re willing to bet dollars to donuts that this will taste phenomenal. Gaspari literally never lets us down in that department. Anyone want to bet us? The product will debut in 2 Lbs. and 4 Lbs. sizes. The label shown above is for the 4-pounder. The reason it’s important that there are no added free-form amino acids is because they can be used to “pad” the protein stats. This has been hot news lately, with a class action lawsuit being filed against Body Fortress, stirring up a lot of consumer awareness that your protein powder isn’t always dietary protein powder. This is all fixed, and Gaspari has awarded us with a bonus gram of protein (now 25g instead of “24”) in the process! More protein, more gains! Because of this, it might end up a bit more expensive, but users in the know have shown that they are happy with that when a company is being honest… so long as they still get the best deal possible using PricePlow and our price drop notifications. But the moral of the story is that when enough people like you and me send feedback on social media, discuss these things in forums, make YouTube videos, and write blog posts like these, the good manufacturers do listen! So let’s keep at it and the products will continue to improve. What is the release date and where do I buy it? As we write this, Myofusion Advanced is popping up at a few retailers, but is still in “coming soon” mode. It should be any day now (mid July 2014) — By the time you read this, it’s probable that it will be available in stock somewhere. But if it’s not available, head on over to our official Gaspari Nutrition Myofusion Advanced product page and sign up for product notifications. Once it’s in stock, you’ll get emailed. After that, you’ll get emailed if the lowest price drops lower. What will happen to Myofusion Probiotic and Myofusion Elite? Long story short: All other versions of Myofusion are going to be discontinued. In the meantime, there’s a lot of existing stock out there, so if you’re a big fan, you can check it out at links  and . We also expect to see some pretty glorious price drops as stores try to clear the shelves of these two products over time. Sign up for price drop alerts with us if you’re a fan! No Comments | Posted in New Products, Supplement News | Tagged Amino Acids, Gaspari Nutrition, Protein Powder.